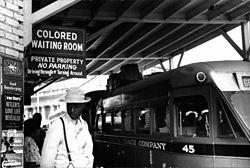 The Jim Crow laws were a number of laws requiring racial segregation in the United States. These laws were enforced in different states between 1876 and 1965. 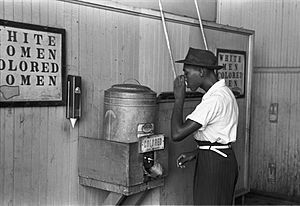 "Jim Crow" laws provided a systematic legal basis for segregating and discriminating against African Americans. The laws first appeared after the Civil War and the Reconstruction Era and were enforced through the mid-twentieth century. They were about segregating black and white people in all public buildings. 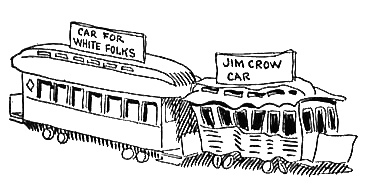 "Jim Crow" was a racist term for a black person. Black people were usually treated worse than white people. This segregation was also done in the armed forces, schools, restaurants, on buses and in what jobs blacks got. In 1954, the US Supreme Court ruled that such segregation in state-run schools was against the US Constitution. The decision is known as Brown v. Board of Education. 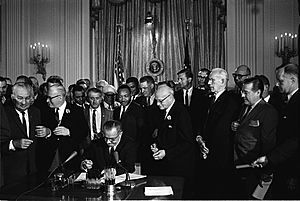 The other Jim Crow laws were abolished by the Civil Rights Act of 1964 and the Voting Rights Act of 1965. The National Association for the Advancement of Colored People (NAACP) fought against the Jim Crow laws. After the Civil War, the U.S. government tried to enforce the rights of ex-slaves in the South through a process called Reconstruction. However, in 1876, Reconstruction ended. By the 1890s, the Southern states' legislatures were all-white again. Southern Democrats, who did not support civil rights for blacks, completely ruled the South. This gave them a lot of power in the United States Congress. For example, Southern Democrats were able to make sure that laws against lynching did not pass. Laws that made it impossible for blacks to vote (this is called disenfranchisement). Since they could not vote, blacks also could not be on juries. In 1896, the United States Supreme Court ruled in a case called Plessy v. Ferguson that these laws were legal. They said that having things be "separate but equal" was fine. In the South, everything was separate. However, places like black schools and libraries got much less money and were not as good as places for whites. Things were separate, but not equal. Jim Crow laws Facts for Kids. Kiddle Encyclopedia.